Gina Venegoni has been an animal lover ever since she could crawl. In fact, her first word was “puppy”. She has realized the biggest challenge people face today is making sure every member of the family is cared for. From running the children to all of their activities, to caring for the home, or harder yet, trying to plan a much needed vacation, one little family member always seems to be a challenge. That one member greets you happily every night when you come home. Your pet. Gina has experienced this problem first hand with her own pets, Max (a Jack Russell/Dachshund mix), Todd (a long haired “cuddle buddy” Dachshund), and Fritzi (also a long haired Dachshund and the queen of the castle). She has come up with the idea of a pet sitting company and animal cab (formerly Hamsters to Horses) to help those who need someone to be there for their pets when they can’t be. Raised in rural West County, she has had the opportunity to care for everything from hamsters to hounds. 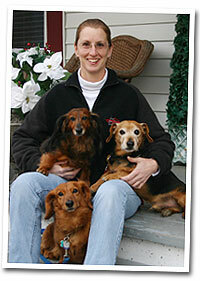 She has also had experience in assisting veterinary doctors. Today, she has decided to commit herself to helping you with the animal members of your family.